The two long-staying Baird's Sandpipers at Marazion and Davidstow this September have prompted me to look at the past records in Cornwall. The exact numbers are curiously difficult to reconcile as records rejected by the BBRC are in fact included in the official CBWPS file. 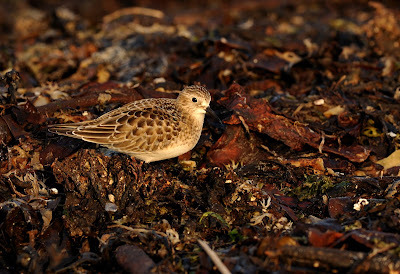 Including the two this month, there has been a total of approximately 31 birds, the first of which apparently occurred in 1965, though this bird does not appear in the CBWPS Report as it was rejected (presumably by BBRC). A similar fate happened to another report in 1966. Thus the first authentic Cornish record was at Ruan Lanihorne and is attributed to Ted Griffiths and Stan Gay in 1980. 1997 Gannel Est on 3 Aug.
1997 Hayle Est. on 31 Aug. Historic Totals Aug 4, Sep 24, Oct 3. The most popular site is Marazion Beach with eight records here. 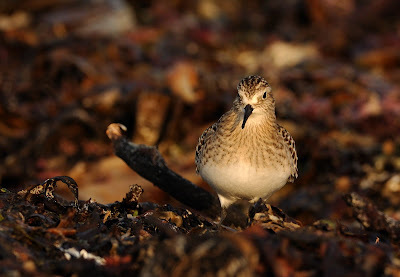 The two images shown here are the Marazion bird and were taken this evening. Many thanks to Derek Julian for providing the records from the CBWPS database.